AUGUSTA, Ga. (May 29, 2018) – Under the increased pressure of glaucoma, scientists want to help the neurons in our eyes better protect themselves and get better help from their friends. They are working to see whether agents that activate the innate neuron protector sigma 1 receptor, or S1R, can do both. Dr. Kathryn Bollinger, ophthalmologist, glaucoma specialist and retinal cell biologist, has evidence that a good additional strategy would be directly enhancing protection of neurons in our eyes, called retinal ganglion cells, hopefully by directly activating S1R. "We may be able to protect the retinal ganglion cells more long term," says Bollinger, a faculty member in the Department of Ophthalmology at the Medical College of Georgia and James and Jean Culver Vision Discovery Institute at Augusta University and recent recipient of a $1.5 million grant from the National Eye Institute. S1R stimulation has been shown to protect retinal ganglion cells in other disease models, but hers appears to be the first work in glaucoma, Bollinger says of the protein that is expressed in both neurons and their astrocytes throughout our visual system. 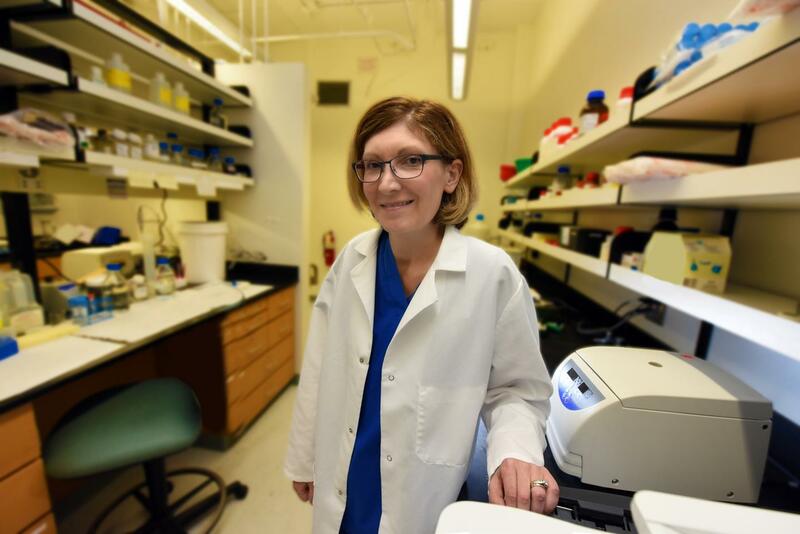 Her work over the past year, funded by a mid-career physician scientist grant from the American Glaucoma Society, has focused on the impact of activating S1R in the astrocytes. The new grant is enabling her to also look at whether activating S1R, with existing drugs already used in patients for other reasons, also enables neurons to better protect themselves. The high pressure glaucoma produces inside the eye seems to transform astrocytes, a type of brain cell that provides nutrition and other support to the neurons, into a nemesis that instead releases toxically high levels of things like nitric oxide and reactive oxygen species. In a rat model of glaucoma, Bollinger's team is further exploring the impact of activating S1R with known agonists like the pain reliever pentazocine and commonly used antidepressants called selective serotonin reuptake inhibitors. They are looking at their impact on neuron survival and function and the level of support from protective proteins like brain-derived neurotrophic factor, which aids neuron survival as well as new neuron growth. One question Bollinger and her team want to answer is how/if these drugs can protect and/or rescue neurons in the face of glaucoma. They are looking again, in culture and their animal model, at what they suspect is S1R's role in mediating the reactivity of astrocytes. Astrocytes' increased reactivity, in turn, appears to prompt release of neurotoxic substances like the high levels of nitric oxide, which further raises pressure and reactivity. But when scientists treat the usually supportive cells with S1R agonists in a dish, the cells back off their bad behavior and appear more willing to release good things like brain-derived neurotrophic factor. Bollinger notes that some astrocyte changes in response to pressure may actually be helpful to neurons while others are deleterious, which is something else she wants to understand. "As we kind of piece together the specific consequences of astrocyte activation, we might be able to better manipulate astrocytes so they will again just protect neurons instead of damage neurons," Bollinger says. "That is our hope." Her team already has good evidence that changes in astrocyte behavior occur rather quickly in response to increased pressure in the tight confines of the eyeball. Now they also are looking at whether activating S1R increases the neurons' own response to negatives like oxidative stress. "We still don't have those answers," Bollinger says. But they have seen neurons in a dish without their astrocytes garner stress protection from S1R agonists. "We know that S1R agonists protect retinal ganglion cells in culture. If we can understand exactly how this occurs then potentially we could come up with a more effective target for treatment," Bollinger says. While she hopes activating S1R works both ways to protect neurons, the bottom line that matters is that it works, Bollinger says. Bollinger's team has no evidence that SIR activity is decreased by glaucoma, rather she suspects the need for SIR increases with this condition. "Given our aging population and the fact that glaucoma is prevalent, we do see blindness secondary to glaucoma," Bollinger says. Conversely, some patients may never experience any vision loss. For the studies, the S1R agonists are injected into the abdominal cavity, but a topical application could be developed if the findings continue to hold, she adds. Their efforts to rejuvenate and regenerate neurons in the eye are likely relevant as well to neurons in the brain and peripheral nervous system, Bollinger says. For example, S1R recently has been shown to have a role in amyotrophic lateral sclerosis, ALS or Lou Gehrig's disease, which affects the nerve cells that control muscles. S1R agonists have been shown to be beneficial as well in animal models of this condition, she says. DOWNLOADS: Click to download a high-resolution photo of Dr. Kathryn Bollinger https://augustauniversity.box.com/s/1ub9tzmpmzau00z1qzfdq8cmfq3mwpli .